Let this be an admission. Back in high school, in early 80s, along with some of my friends we wanted to start some sort of a band. Unlike the States where everyone seems to have passed through a band of some kind (even if it was your local marching band), that occurrence wasn’t a commonplace in the former USSR. Our high school, not the worst in the area, actually did have some electric instruments stashed away in the janitor’s closet. With my parents urging and insistence I actually took some piano lessons and envisioned my role on keyboards. Of course, nothing went beyond talk and nothing ever materialized, even though lads who graduated a couple of years prior to us managed to pull something cohesive for a quick jam on a prom night. Even though my buddies managed to come up with nothing (not enough determination and practice time), what we thought about playing was some gritty rock’n’roll, not some soft crooning, like the guys who used those dusted instruments before us did. We wanted to prove our toughness and character. Obviously, around the world there were many people who had similar ideas, but some of them were a lot more determined and light years more talented. The US (Salt Lake City) unit Crisis was one of them. Back in 1984 they roared on the scene, mostly European, since their sound was better suited on that side of the Atlantic, with the EP Armed to the Teeth. I admit I did not hear it at the time (my mind being all wrapped around Judas Priest and Accept), but I distinctly remember the EP cover (see the picture above) making a strong impression on me while I bought and sold music on the underground vinyl market in the middle of Kiev at 14. (The model is not to be confused with the Accept’s Breaker).Traditional and heavy metal historians Shadow Kingdom are filling my metal education gap by reissuing not only Armed to the Teeth today in 2010, but also the follow-up Kick It Out on the same CD, with the second disc containing thirteen little known and unreleased Crisis tracks. It was the unfortunate circumstances surrounding the release of Kick It Out that eventually doomed the band. Armed to the Teeth was very well received in Europe in 1984, but the UK label Bullet Records went belly-up and left the band in limbo with poor distribution and without their master tapes. The years of struggle ensued and Crisis, the trio at the time, never got going despite several restarts, moniker and bandmembers’ changes. To read the whole history, you might want to get the actual Shadow Kingdom issue, as always complete with thick and informative booklet. As far as music goes I can see why Armed to the Teeth would appeal to European blue collar UK and German crowd. Tap your foot and nod your head, the EP was full of driving aggressive rockers with hooks galore, simple on the surface but sharp and catchy (Crank It Up, We’re The Boys, Break in the Action). Diane was the song that never materialized band of ours should have come up with, making all those high school girls pay attention to us. Urgent and throbbing guitars by Jeff Cross, rock’n’roll drum rolls of Bret Desmond and high vocals by Dane Thomson with screeches and yelps had as much American in them, borrowing from the likes of Quiet Riot, White Lion and Motley Crue, just like they did reference Motorhead in their reckless abandon and attitude. Kick It Out, if it saw better fate, could have been lauded for consistency or criticized for lack of progress. 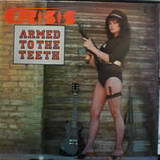 While Europe began discovering twin guitars by then, Crisis was still going out with their brand of dirt’n’grit metal-friendly rock’n’roll. The songs did become longer and more metallic (Kick It Out, Metal Meltdown) and some thrash elements (Keep Fighting) could have endeared Crisis to the fans of early Warlock (the vocals bear a certain similarity). Still propelled forward by genuine simplicity and aggression, Crisis did keep their rocking elements in full force, Don’t Come Back fitting well on Armed to the Teeth and At Night beginning with a truly ACDC riff. The EP did sound if not live, then all recorded as in one take, in line with the band’s hardworking image and certain demographic appeal. The label did a cool job of remastering and presenting Crisis unreleased songs on the second disc. What could have been a bunch of low quality leftovers actually sounds rather cool and good ol’ times, giving a glimpse of history without sounding dated and unlistenable. With their unreleased library Crisis shows more depth and breadth, from stoic metallic Dodged Another Bullet to preachy It Isn’t Easy Being Me to WASPian Lighting Fires to roughed up Chuck Berry rock’n’roll Stand Your Ground to somewhat ridiculously sweet radio "hit" Blue Roses. And, yes, there is one acoustic countryish ballad, the closer Kicked Around. Jeff Cross even gets on the act singing in a couple of spots, his crooning lacks the higher octave shown by Dane Thomson. All at once two discs and twenty seven tracks of Crisis retro traditional metal may be a little too much to digest, but on their own just about any song presented here stands on its two feet and does its creators proud. My personal tastes in music have evolved way past these early 80s hooky rockers, but it is always nice to be reminded where you stood two and a half decades ago.